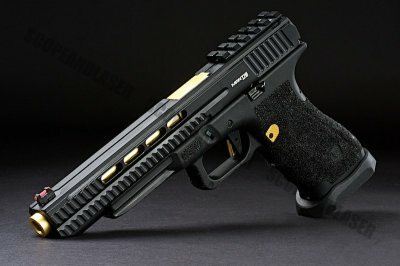 The APS PMT Mantis, most likely named after the Chinese martial arts, the Northern Praying Mantis, involving a very aggressive fighting style, seems to have been APS's main focus as this pistol does have a rather aggressive look. 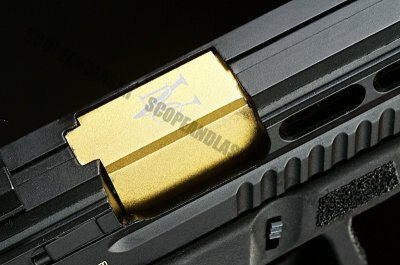 The grip and trigger guard of the polymer frame was machine stippled which adds grip. The extended slide lock and magazine release, the additional magwell and the serrations along the metal slide all contribute to quicker and more effective reloads. A flashlight or laser to be applied to the bottom rail for a more tactical look and a red dot will easily fit the top rail, which also acts as a rear sight to the fibre front, if you opt for a race build. 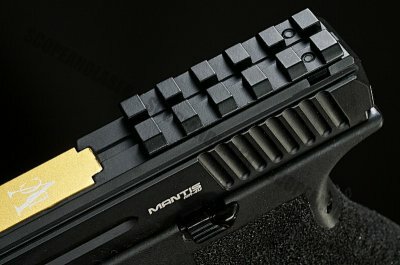 The Mantis comes with a 23 round magazine which you would fill with green gas. The recoil spring feels great, snappy even, when you continuously wrack the slide back and let go, which we all known is an addiction to most. 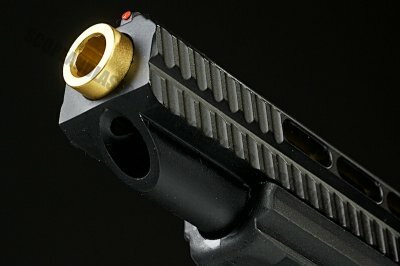 APS also have a 23 round CO2 magazine. Unfortunately, you will have to buy it separately, but it kicks a lot harder pushing BBs out at around 310 fps. The magazines can also fit in Marui and vice versa. For skirmishing, it serves a purpose as having an extra flashlight or laser unit could help. 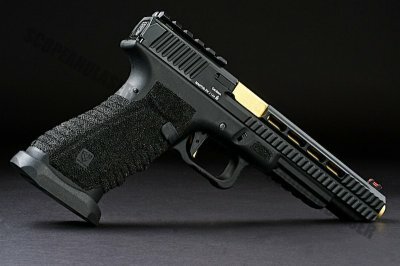 For IPSC the amount of money you?d spend on an actual race pistol with a reflex sight is pretty expensive yet this version is far cheaper at 180 US dollars. For the price point, it?s a great beginner?s Race and or Skirmishing pistol.